It was another good work day on the project with beautiful sunny weather.. Not so good for those on the east coast. Kye mentioned he was doing some work in Princeton, New Jersey in the spring and the course experienced a loss of over 200 trees. Mostly pines but still some significant damage. The staff worked on the two right bunkers on #6. 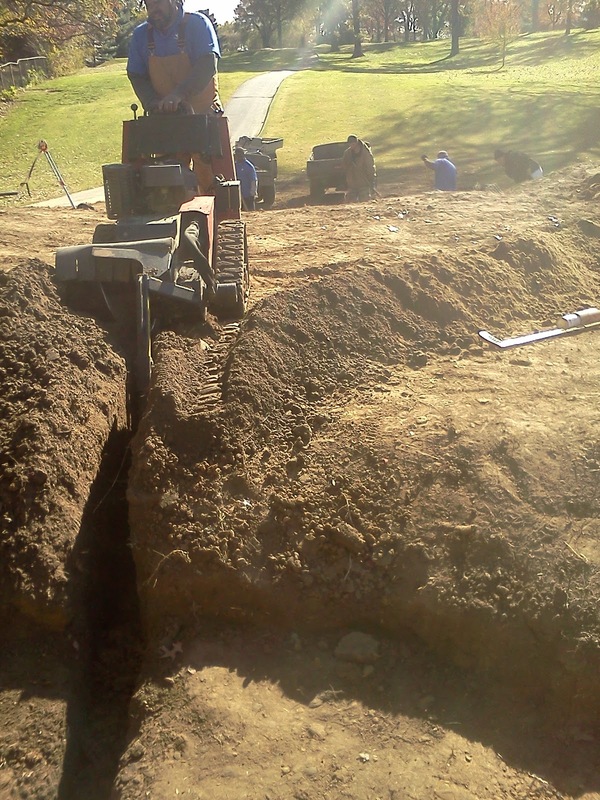 They were edged, trenched, and drainage installed. Today will be a big push for us in closing the work on #3 and #6 with sand being added and sod being laid around the four bunkers. 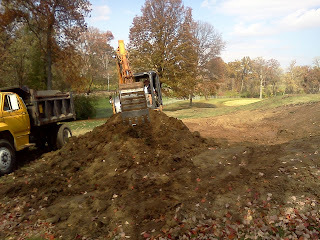 Kye completed his work today with the practice bunker and shaped the piles of soil on the driving range for targets. 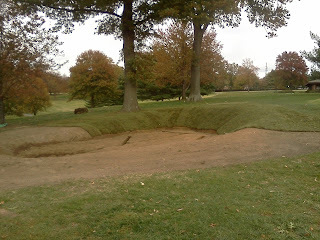 We were short a little bit of sand/soil and will finish shaping these over the next few days when time allows. #6 front right bunker trenching. 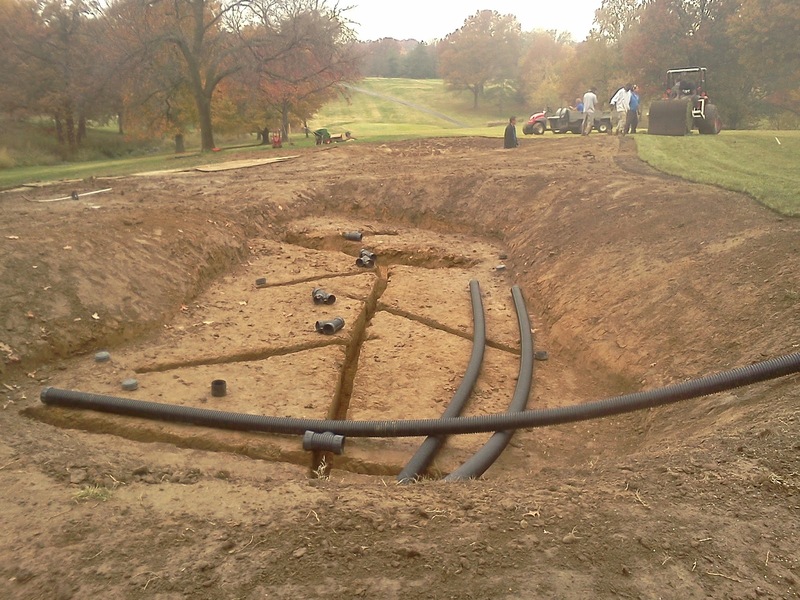 #6 irrigation line and wire avoidance. We used our wire locator to track the line and then had to dig two holes to find the pipe and wiring so we would not trench through it. 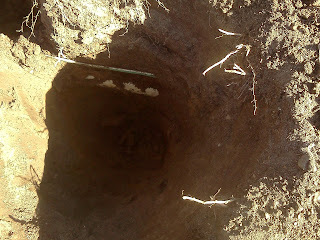 We were able to go over this one but the second we had to dig underneath the pipe. 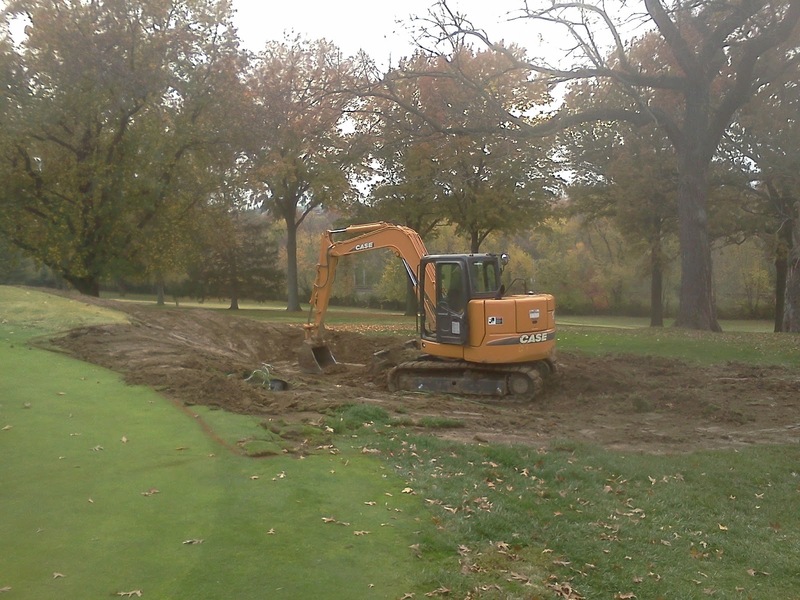 Skip trenching out of the right rear bunker. Staff trenching and cleaning spoils from right rear bunker #6. 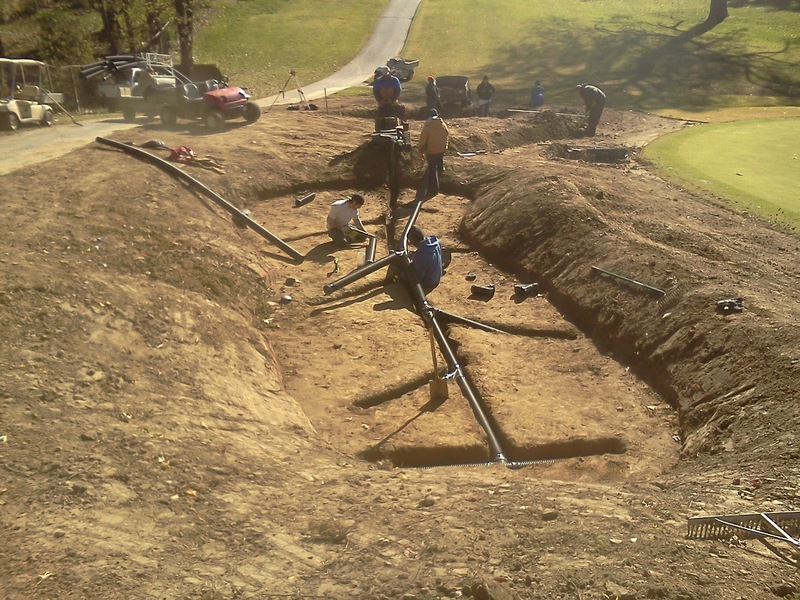 Drainage being installed in the right rear bunker #6. Kye shaping the practice bunker. 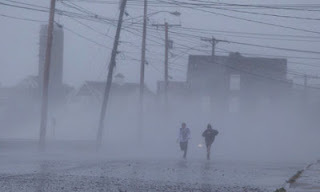 I've whined a little about the wet conditions over the last month but it could be worse! 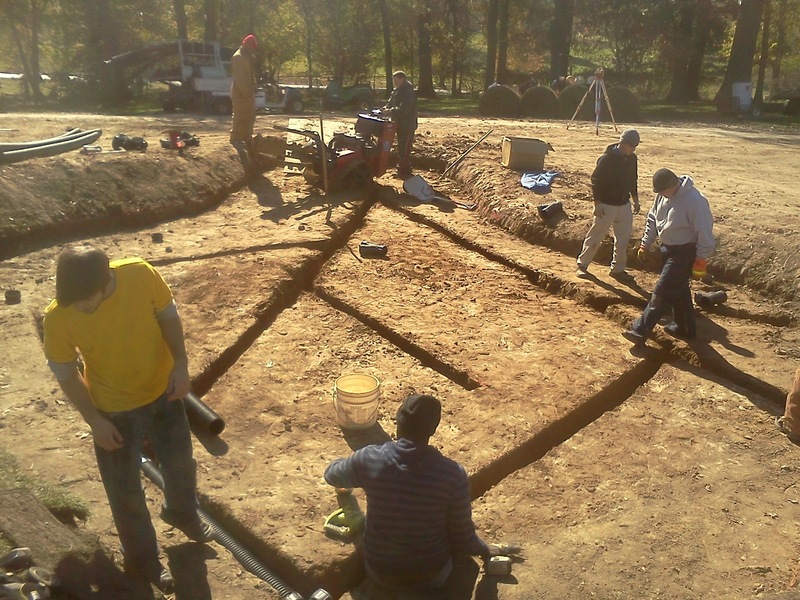 We were able to get some work completed on Saturday and had a great day of work on Monday. 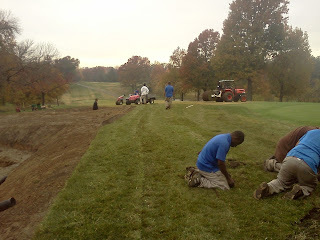 It was still wet on Saturday but we were able lay sod on a couple of different holes. 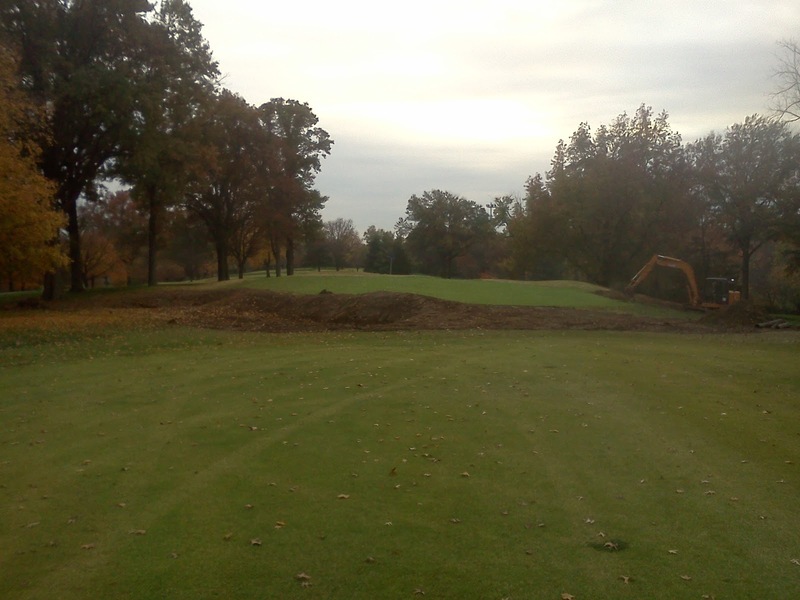 We widened the fairway approach on the right side of #1 covering the old bunker. We also finished laying the sod on the new approach of #17. The staff also completed sodding the left bunker of #3 which finished that bunker. On Monday, the staff ,.edged, trenched, installed drainage and added some sod and sand to the two right bunkers of #3. 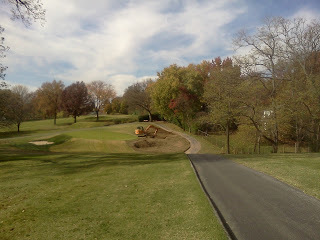 We also did some additional sodding on #13 which nearly completed this hole. 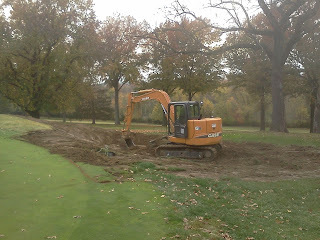 The staff will be working on #6 today and should have it ready for sand on Wednesday and we will finish #3 as well. 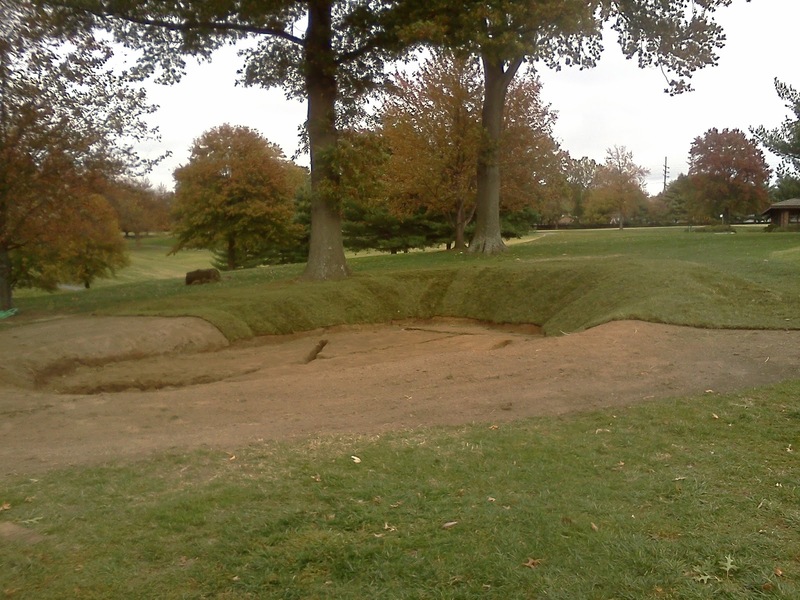 Our hope is to get 6-8 bunkers completed this week giving us 5-7 left to complete. 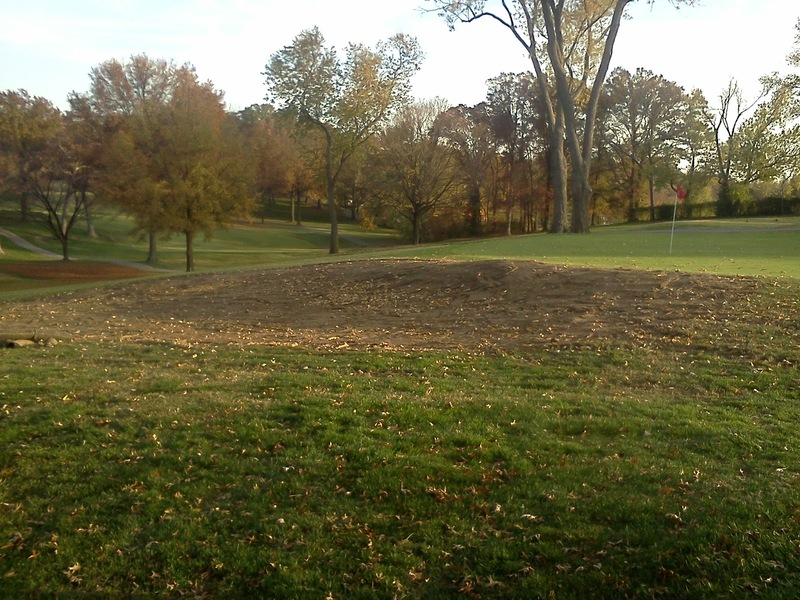 Kye finished his last two bunkers on the course at #6. Today, he is working on the practice bunker and will be shaping the practice greens on the short range. #1 sodding of old bunker. #3 right front bunker trenching. 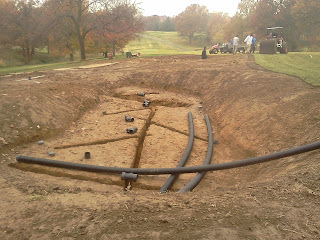 #3 Right front bunker drainage install. 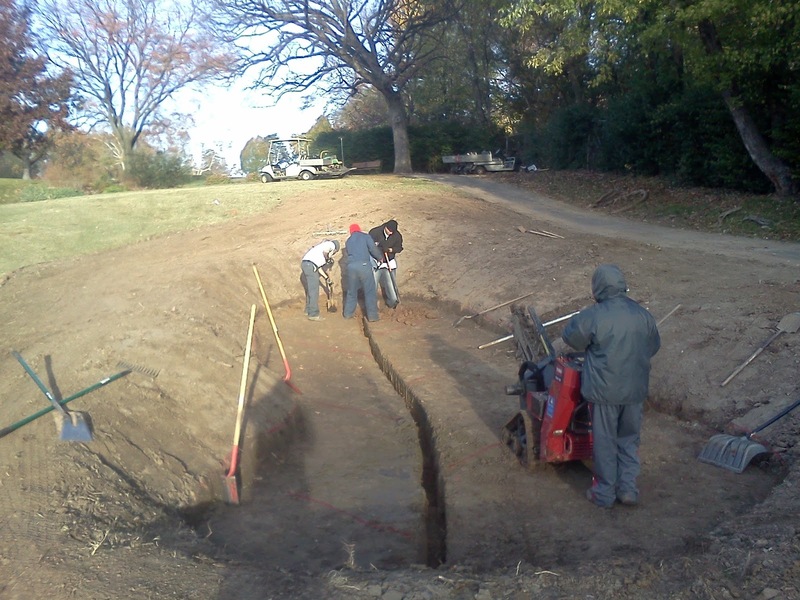 #3 Right rear bunker install. 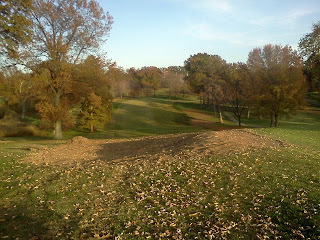 Same area but looking from the back of the green. Kye working on #6 bunkers Saturday. 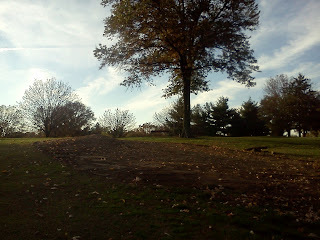 A view near the tee. 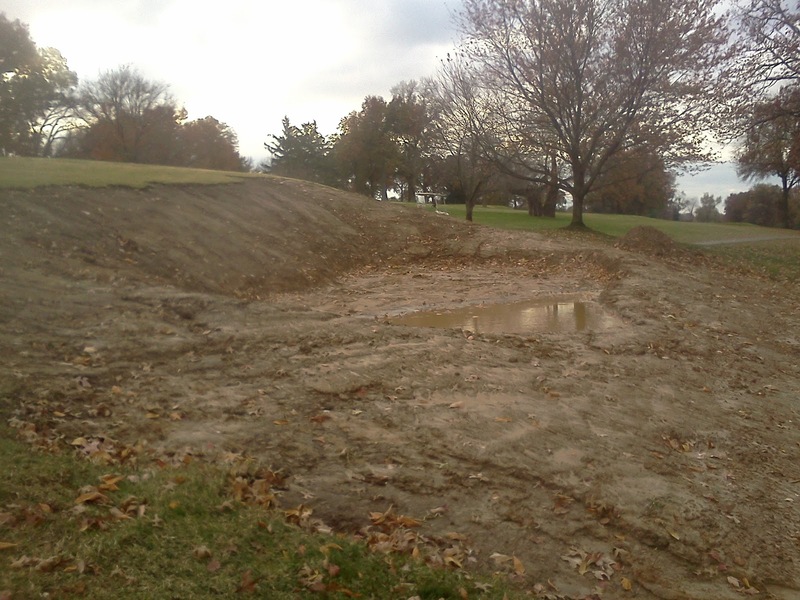 The staff worked on sodding #12 bunker area that was removed, the new fairway area in front of #17 and started to cover the approach area on #1 before the rain arrived. 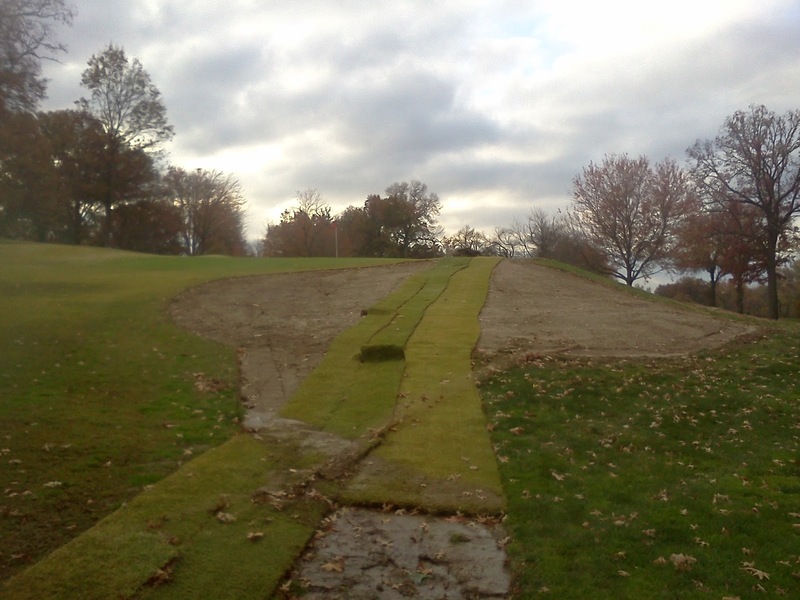 The left bunker on #3 was trenched, spoils hauled away, drainage and sand installed and some of the sod was laid. 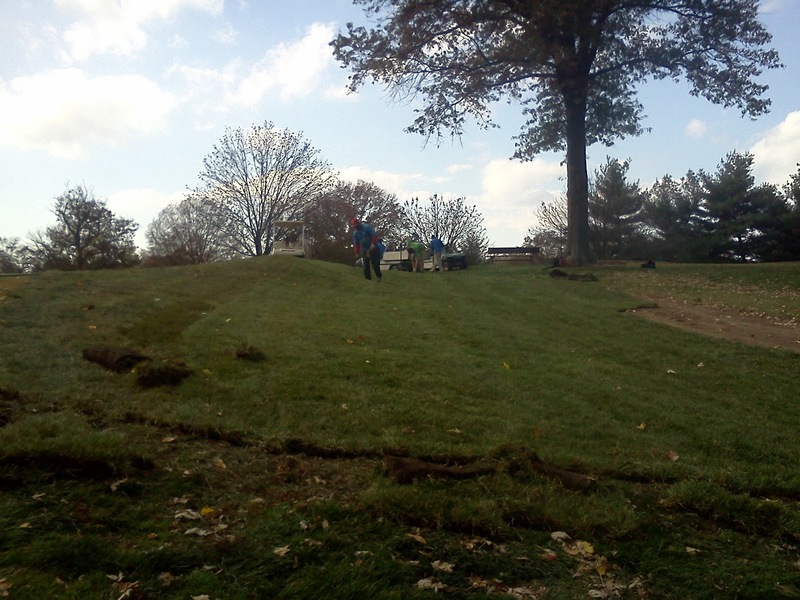 We stripped away the sod and assisted Kye in removing the material out of the right rear bunker on #6. We did a little more sodding and hauled some soil into the lower right side bunkers on #13. A little more sodding and they will be complete. I think the rain has shut us down until Monday except for some sodding. Kye finished shaping #1, a little clean up on #17 right bunker and moved to #6. He will hopefully finish #6 on Saturday and just has the practice bunker and some help he is giving us with the target greens on the short range. 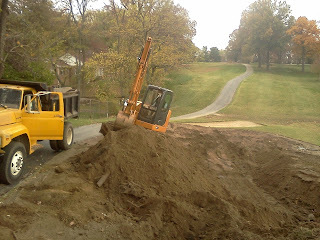 Kye loading excess soil and sand from new #1 bunker. New #1 bunker after last nights rain. Widened approach of #1. 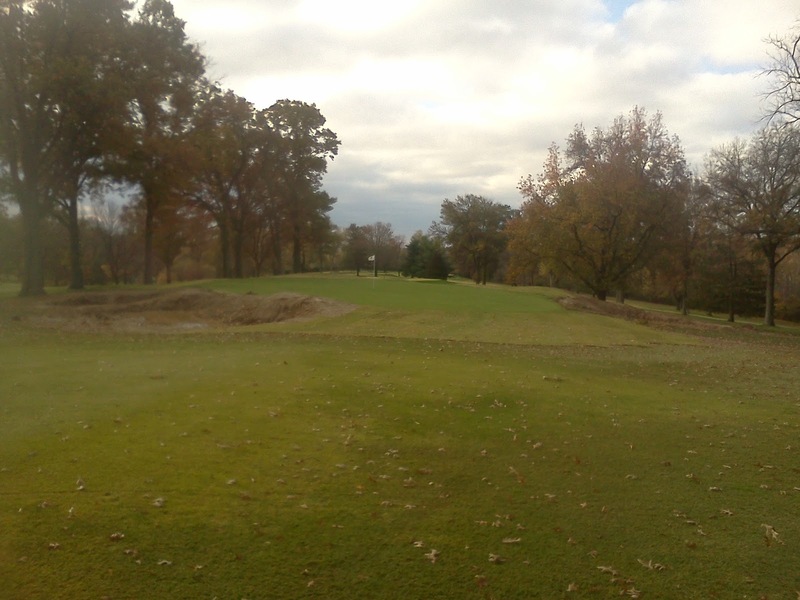 Fairway from the sod to the left and rough to the right side of the sod. 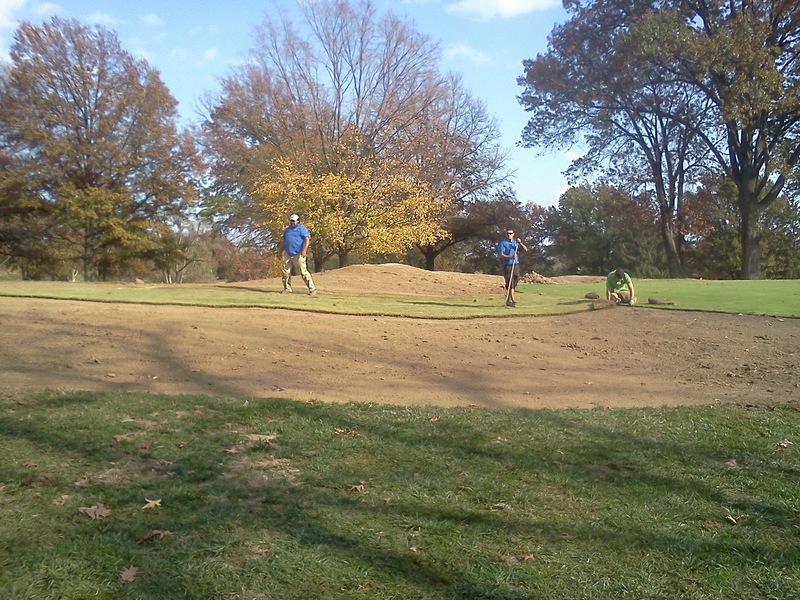 The staff adding sand to the left bunker of #3. 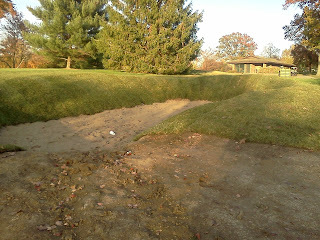 Partiallly completed #3 left bunker. Needs some additional sod work. 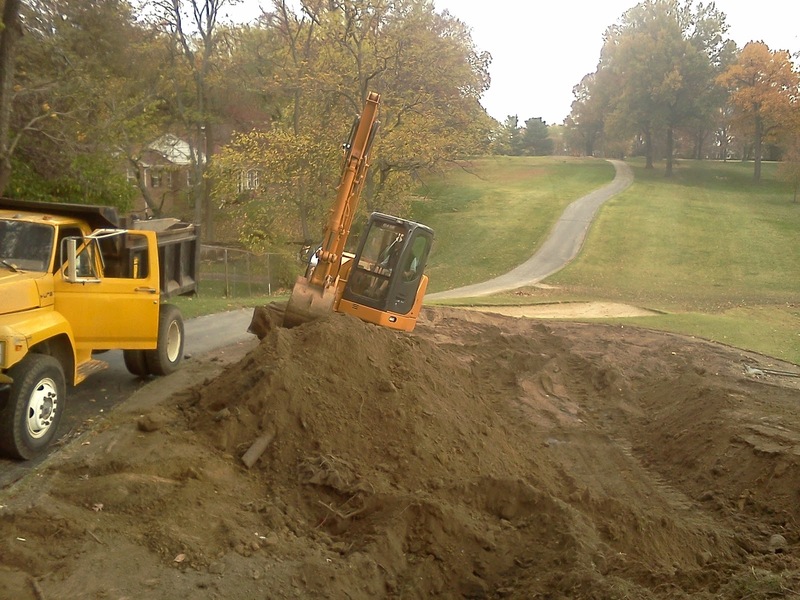 Kye removing sand from #6 rear bunker. Sodding the old bunker area of #12. 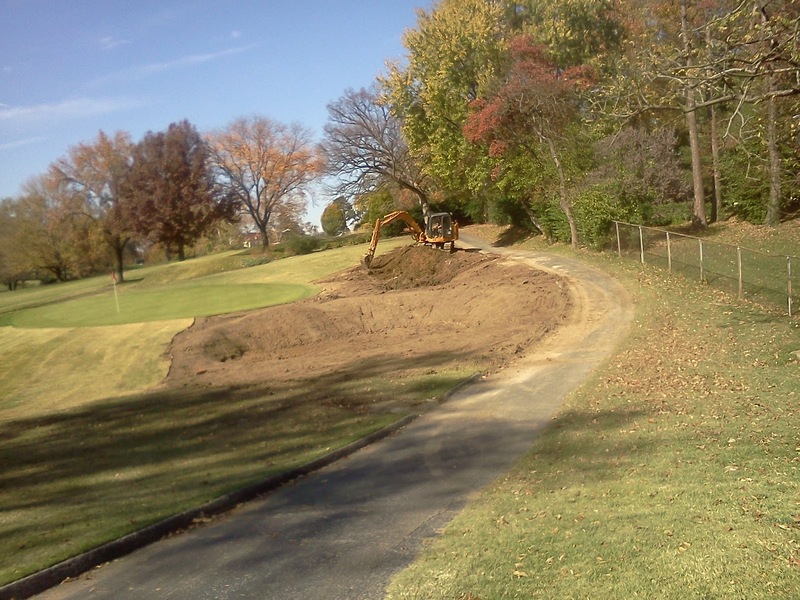 Sodding the new fairway approach of #17. 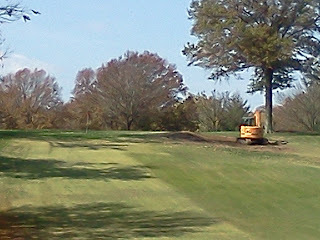 The new fairway approach into #17. After another day of rain, we brought our contract labor staff in a little later this morning to insure that it was dry enough to work. 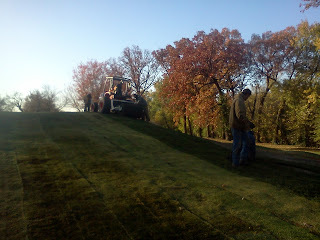 Our regular staff worked all day on leaves because it was too wet to work on the bunkers. 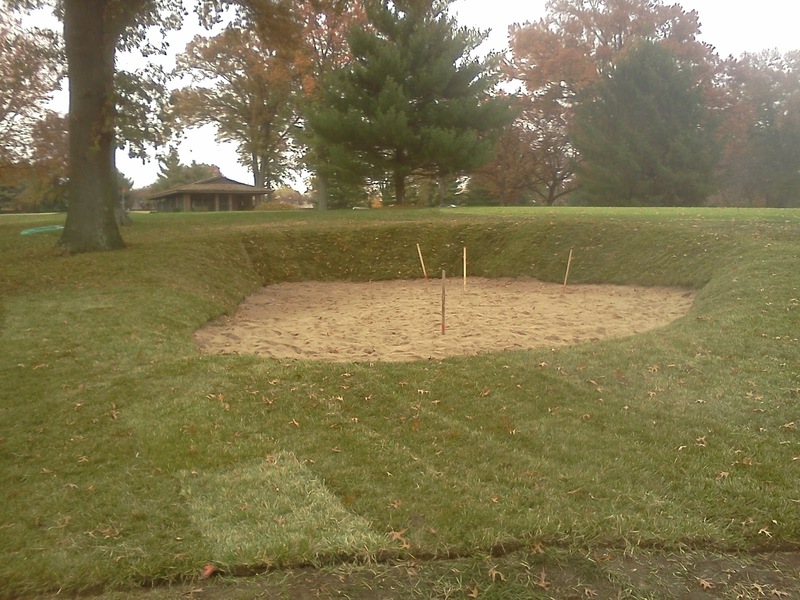 We were able to get the drainage gravel and sand installed in the right rear 13 bunker and were able to finish the sand in the right front bunker. We still have some sod to lay and #13 will be finished. We stripped sod from #12 .and #1 bunkers preparing for Kye to move into which he did. We only have one bunker that will be dry enough to work in on Thursday which will be the left bunker on #3. 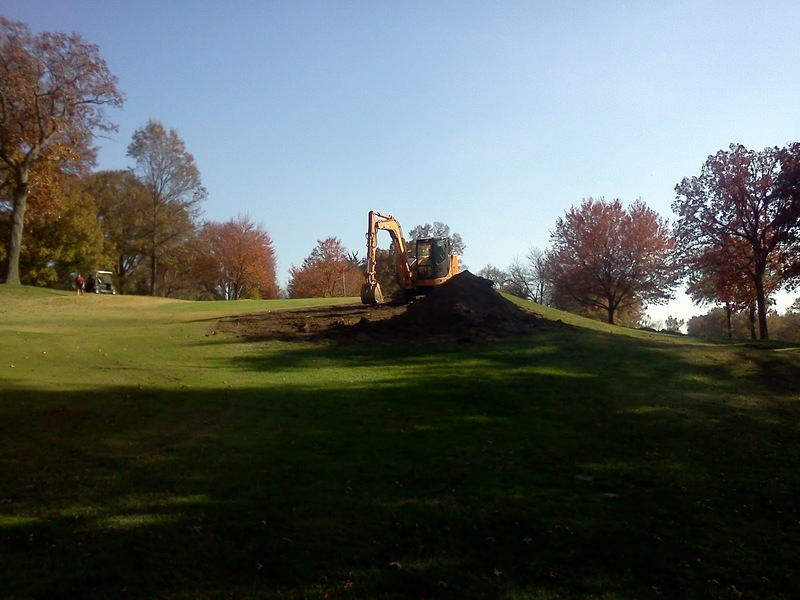 We plan to sod over the area on #12 where the bunker was removed, also on #1 and the new fairway area on #17 before the rain arrives Thursday evening. 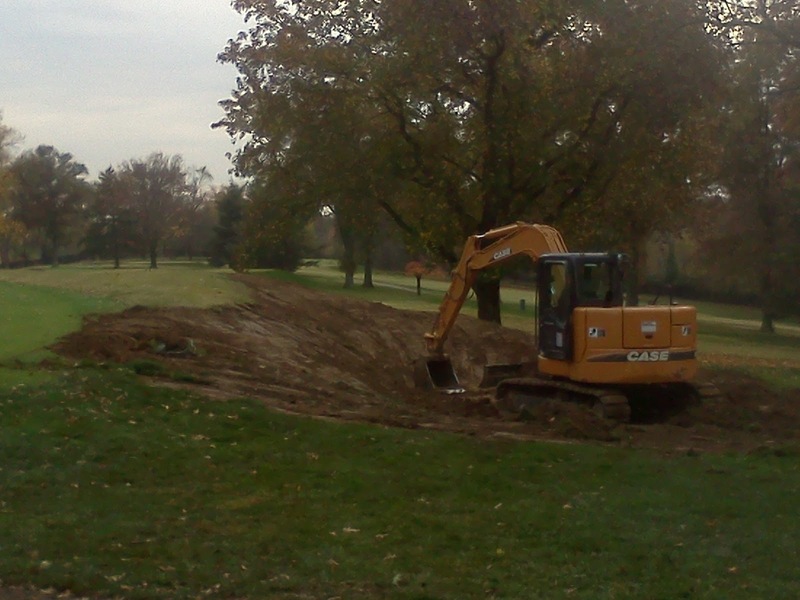 We will probably tear out the right bunkers on #6 as well. 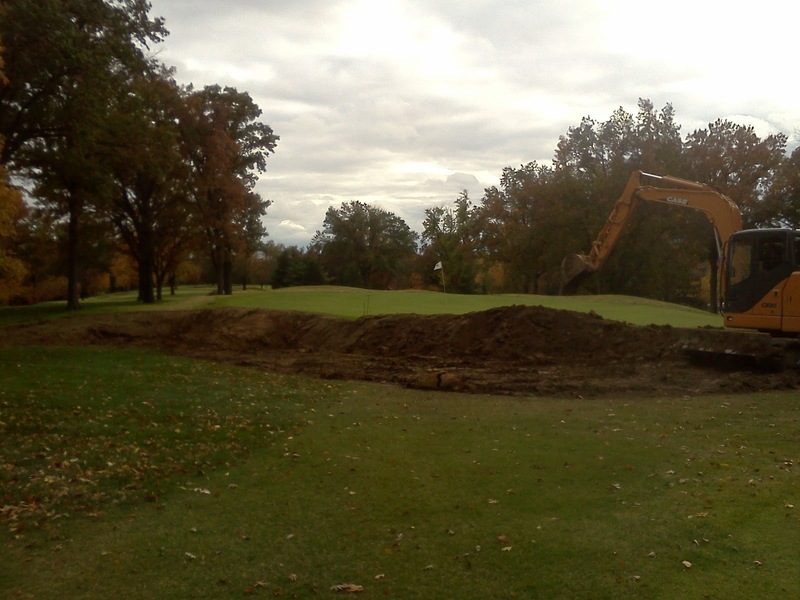 Kye removed and shaped the right bunker on #12. 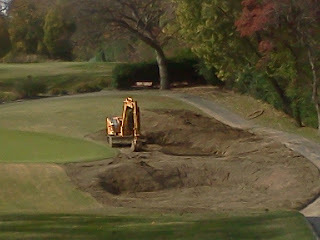 He removed and shaped the front bunker of #1 and is currently working on the new right green side bunker of #1. He will then move to #6. He has about one and a half days of work before he is finished with his work. 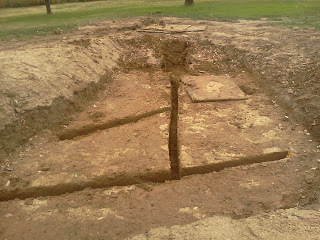 #13 right rear bunker drainage and sand added today. Dirt work will be completed in morning as well as some additional sodding. 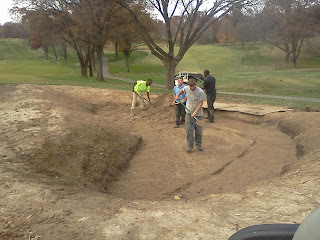 Kye filling in #1 bunker. 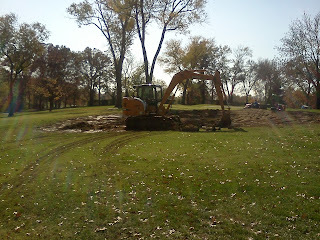 Kye adding the bunker on the right side of the green of #1. 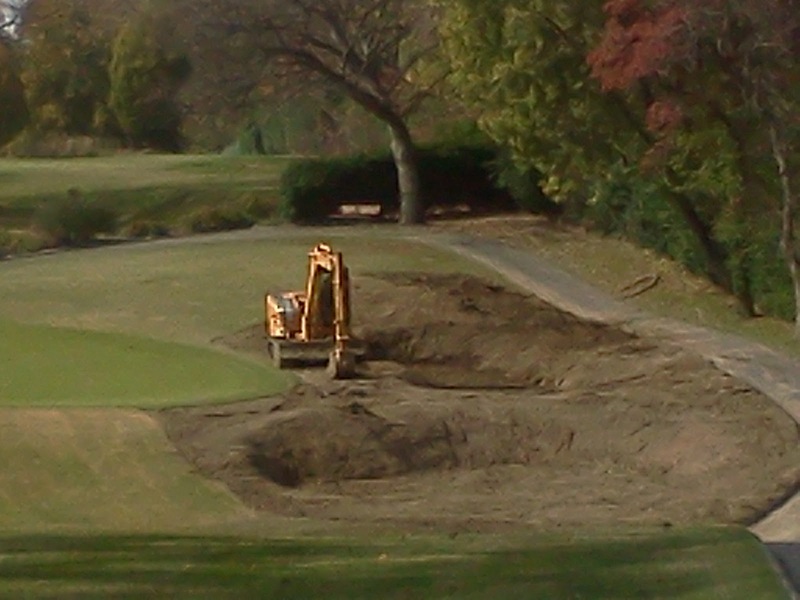 Kye shaping and removing the right bunker of #12. 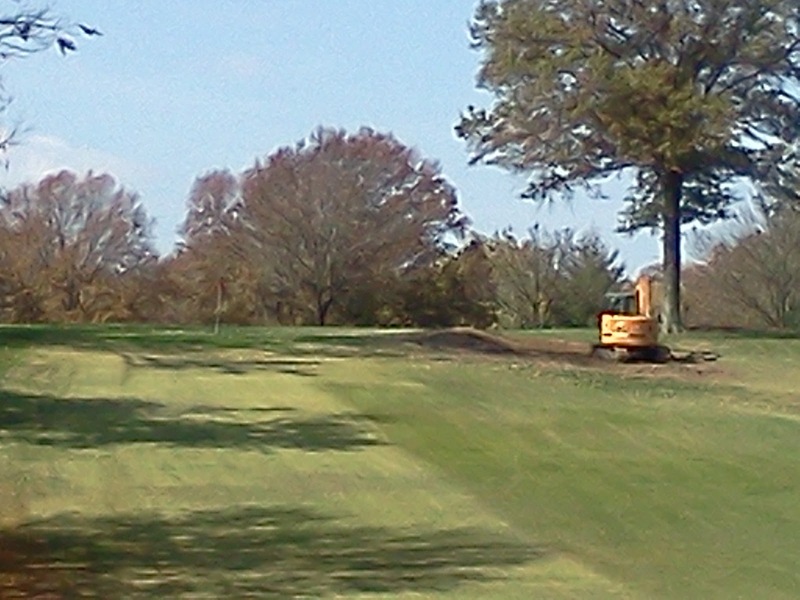 Closer view of Kye shaping #12. The finished product of #12. We plan to grass on Thursday. View from the back of #12. With just enough rain overnight on Monday and before the heavier rain(that nasty four letter word) took place yesterday, the staff went all out blowing, raking, vacuuming and chewing up leaves that had fallen on the golf course. They are out there again this morning fighting their way through the blizzard like leaf drop that is happening. Our early drop has been going on for the last couple of weeks(maples, ash) but it appears the big drop is a little early this year. The oaks are dropping in mass quantities all over the property. Of course the timing could not be any better along with the rain events and the bunker project. We will not have all the staff out chasing leaves on dry days when we are working bunkers but we will be sure to have enough staff working on leaves getting them cleaned up for you and your guests over the next couple of weeks as necessary. 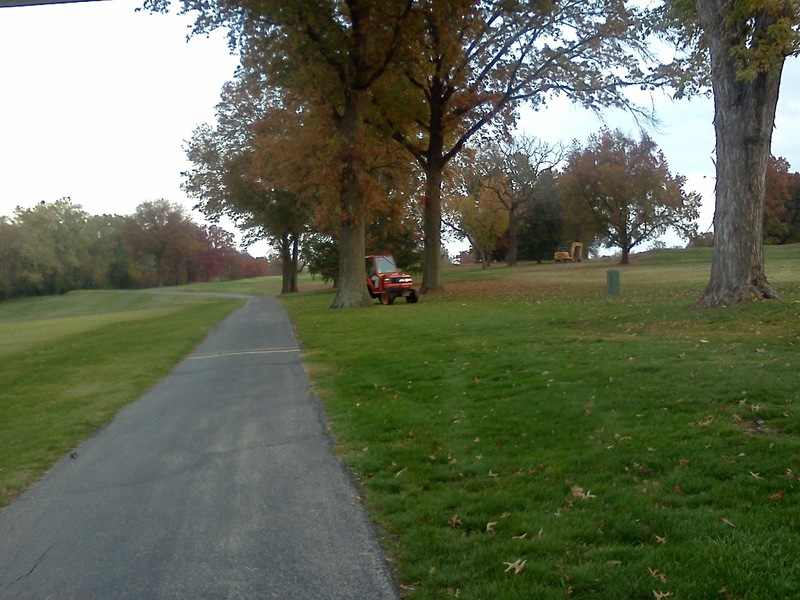 Jeff blowing leaves along #2 fairway. This will not be a long report. Having a little trouble typing because of a wrist sprain. No it did no happen climbing out of one of the new bunkers! We only had .04 hundredths of an inch but just enough to make our work area turn into a pig pen. 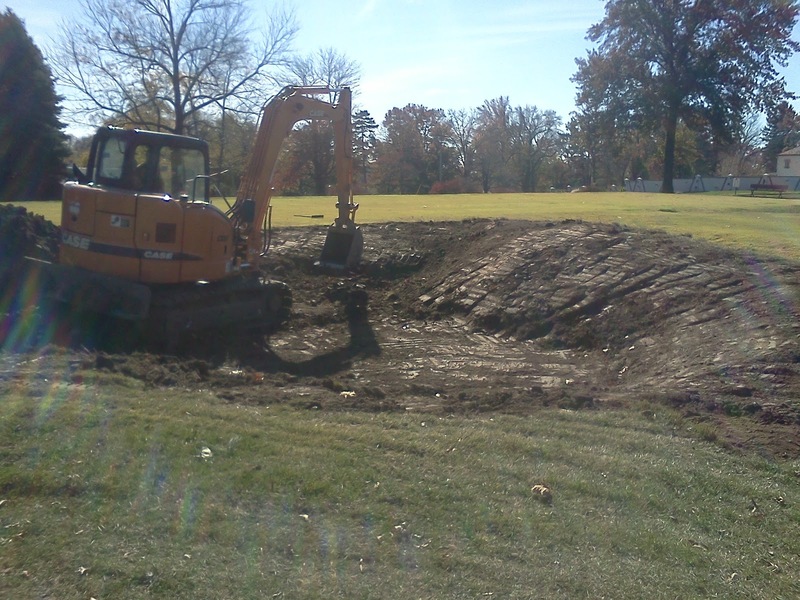 We have # 13 bunkers two thirds complete. We should complete them in the morning and then move onto 5 if it is dry enough. 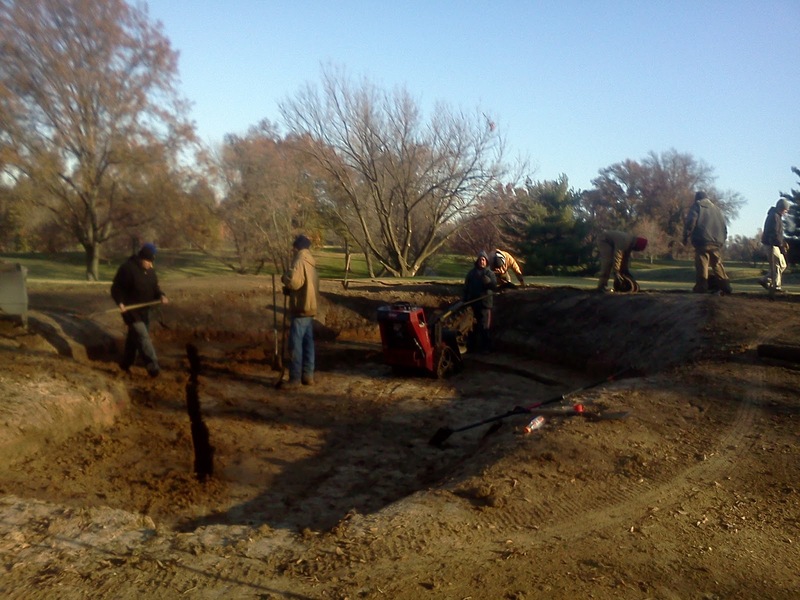 Skip took some guys to 5 and finished our irrigation install and outflow drainage for the left approach bunker as well..
We will tear out #1 in the morning as well as #12 if time permits. Kye was working on the right bunker of 17 and will complete it in the morning. He will then move to #1. 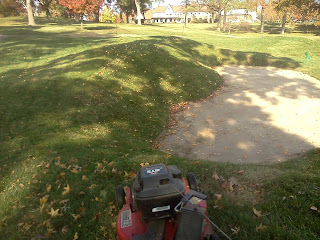 #9 bunker bank push mowing. The hole is open for play, bunkers too! Staff sodding the left side bunker #13. 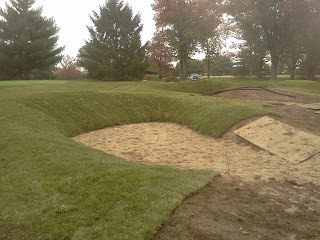 #13 left bunker near completion. #13 right rear bunker drainage being installed. We did wait because of the threat of a thunder storm. 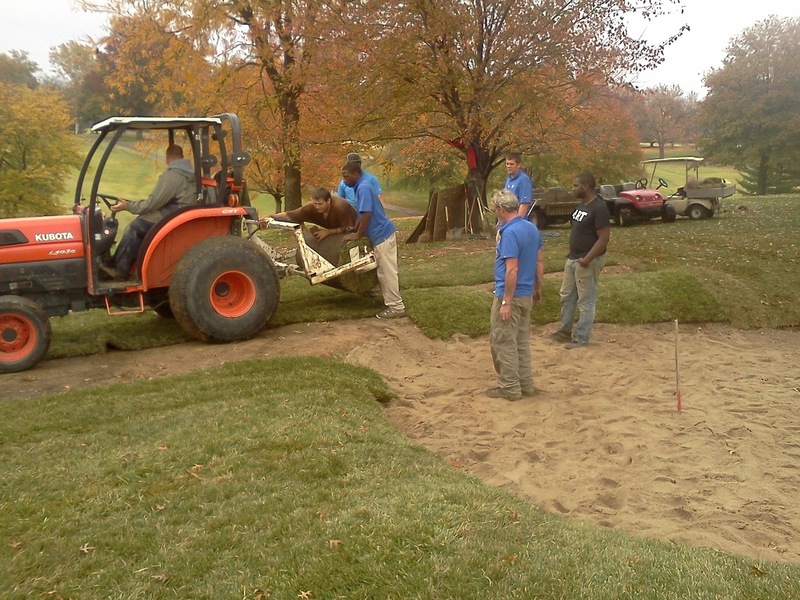 Sodding of the right side bunkers. Right front bunker sodding and sand being added. End of the day on #13. 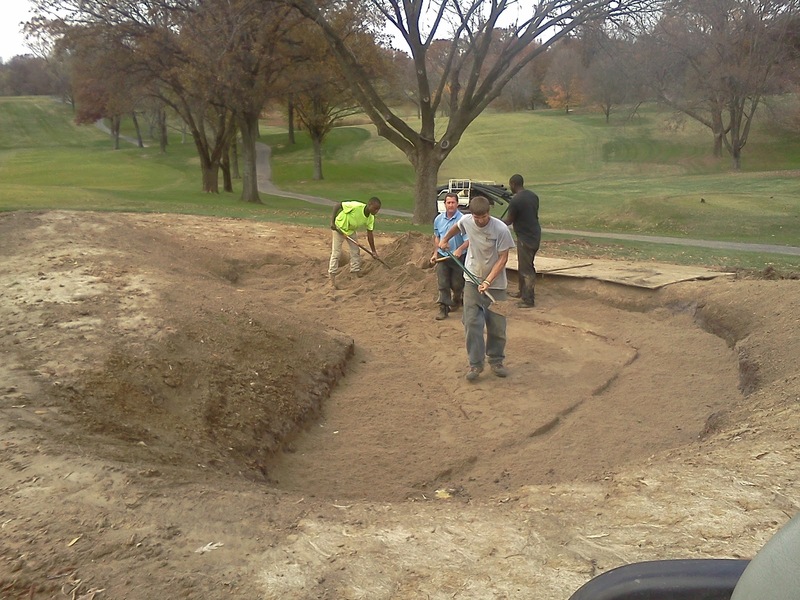 #17 Kye shaping the right bunker. View of the 17th green with Kye shaping in the background. 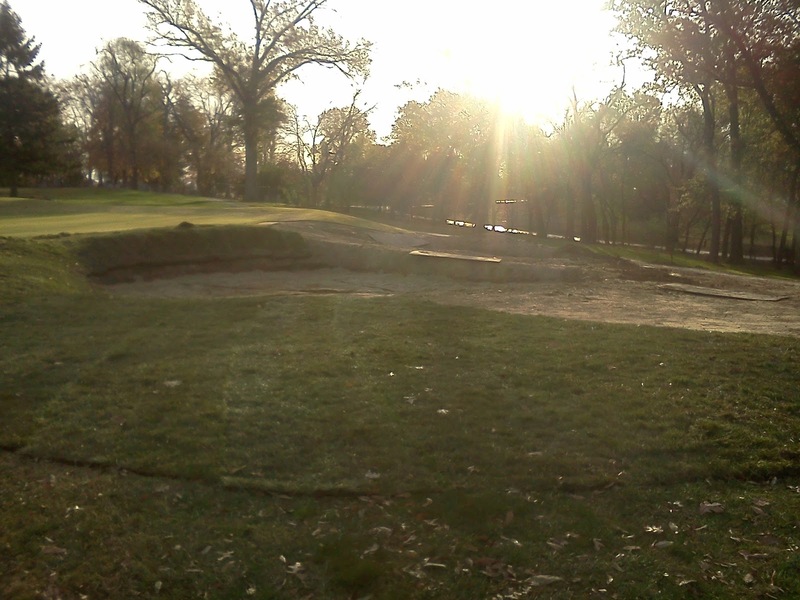 Another view of the right front bunker #17. Had only 3 guys working with me this morning on #13 right side bunkers. 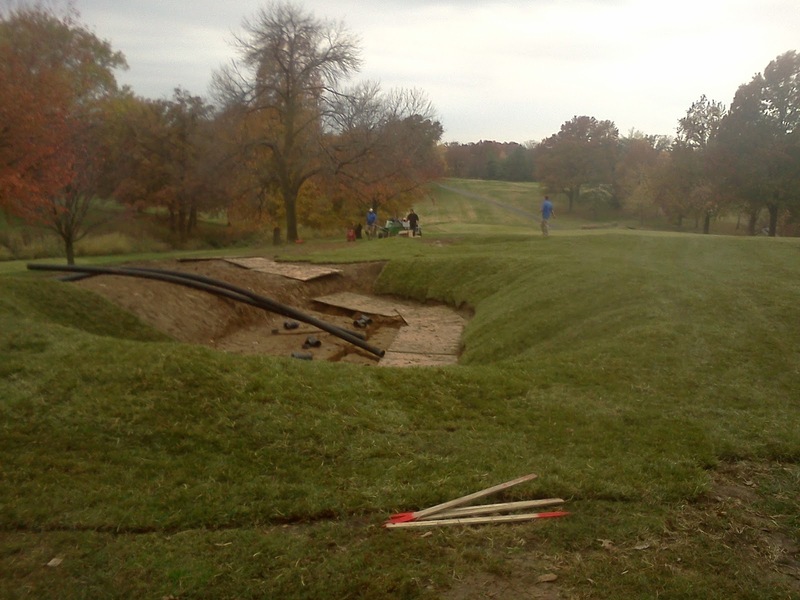 We did some additional trenching and got the bunkers a little closer to being completed on Monday. 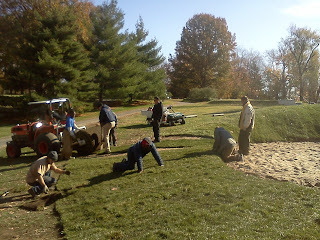 The rest of the staff was preparing the course and blowing and mulching leaves for weekend play. While typing this post, the sun is streaming through my window giving way to a beautiful sunny afternoon. The long shadows of fall gives the course a really great look and the temperatures make it even better. 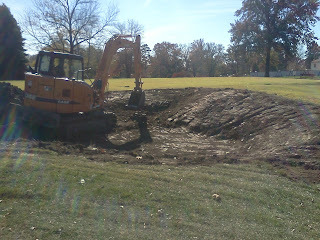 Kye came in and finished the two left bunkers on #17. 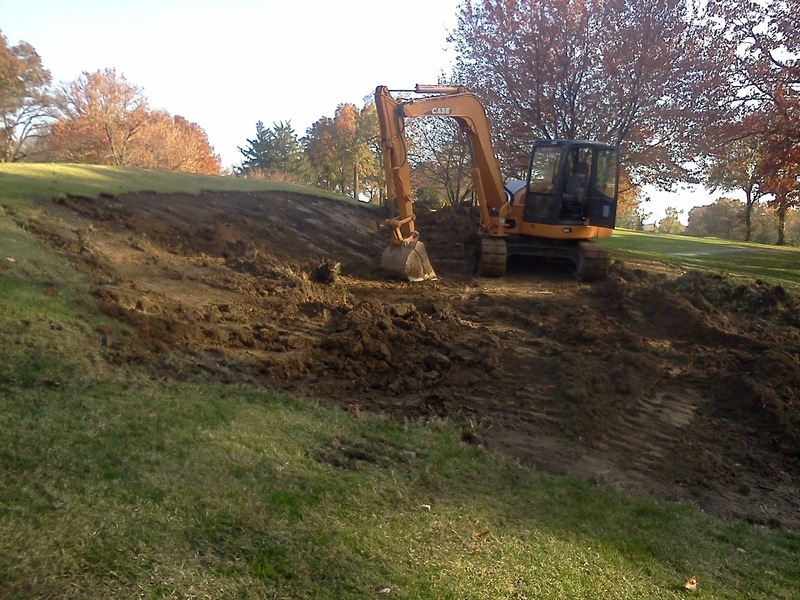 He will be completing the right bunker on Monday and will then move on to #12, #1, practice and then 6 will be his last two bunkers. The forecast for temperatures next week are great for the beginning of the World Series here in St. Louis(I hope) but rain chances have continued to increase for the week so we will have to see how things go if we can get Kye's work completed and we can focus on putting everything back into play. 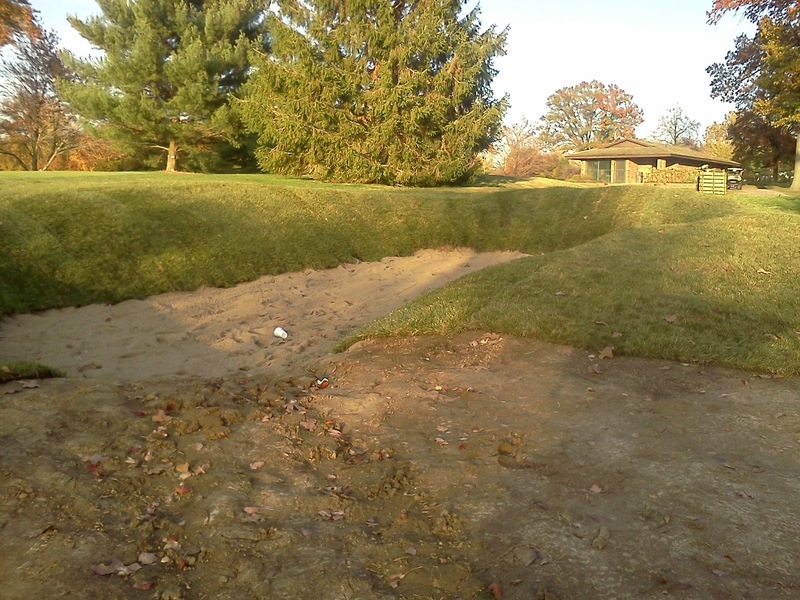 #17 left side bunkers. 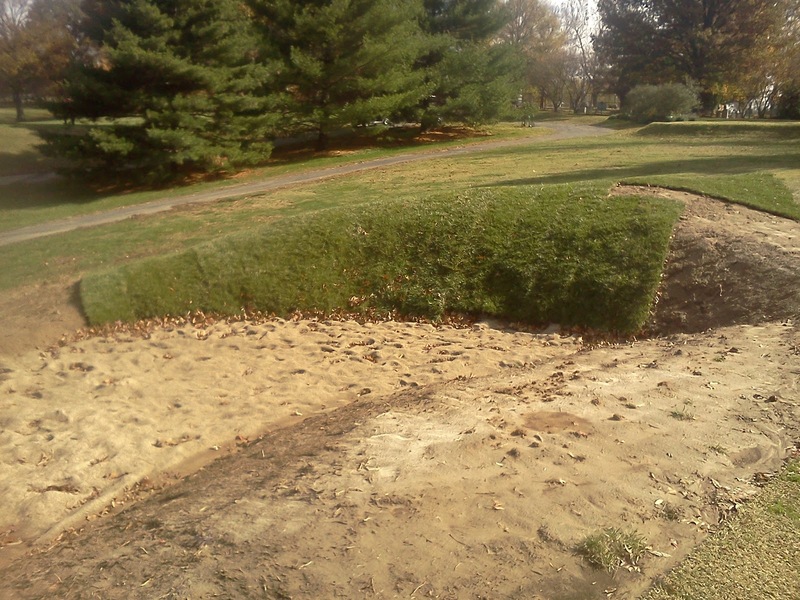 There is only 10 paces between the edge of the mound on the right and the right side collar of the green so a slight opening but no large scale opening after removing the front bunker. The hole and green look really good without the bunker in front. 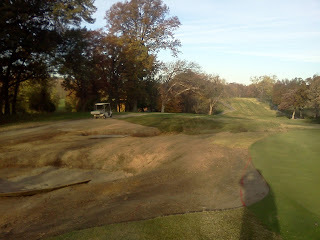 Day 21 Bunker Restoration, Close it out Birds! Day 21 was a good day for the staff today. Blustery with some light rain on and off a today but we were able to get some work completed. The left bunker on #13 was trenched, dirt removed and sod laid on about 1/2 the bunker. 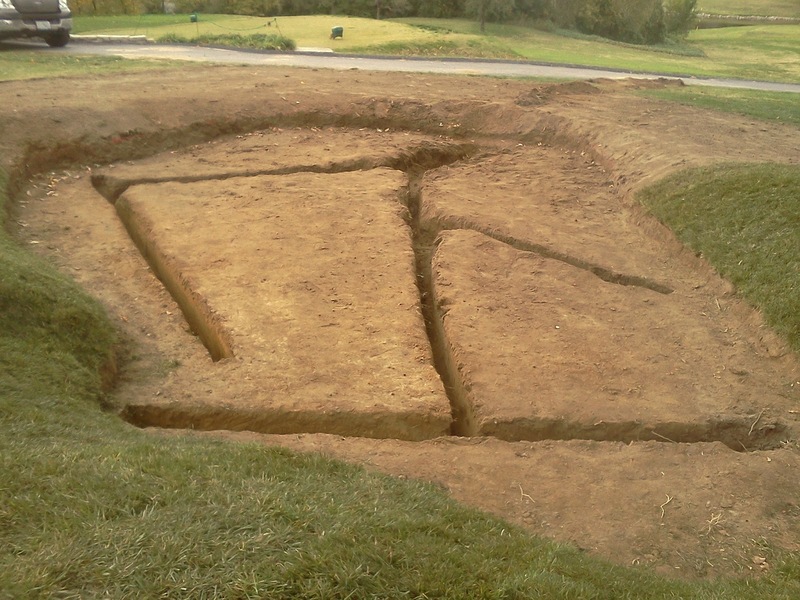 The right front bunker of #13 was trenched and soil cleared away. 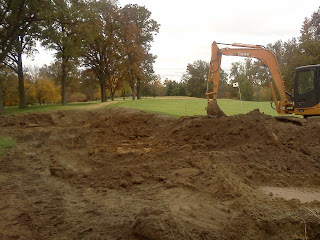 On Saturday, we will finish grade and clean up the bunker and will trench and clean up the right rear bunker in preparation for drainage install, sand and sod. 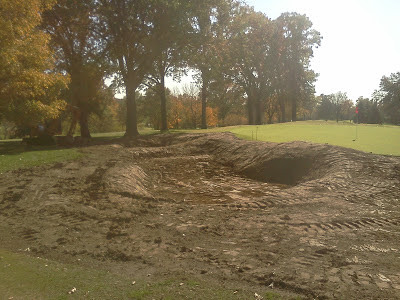 I expect that all 3 bunkers will be ready by the end of the day on Monday. 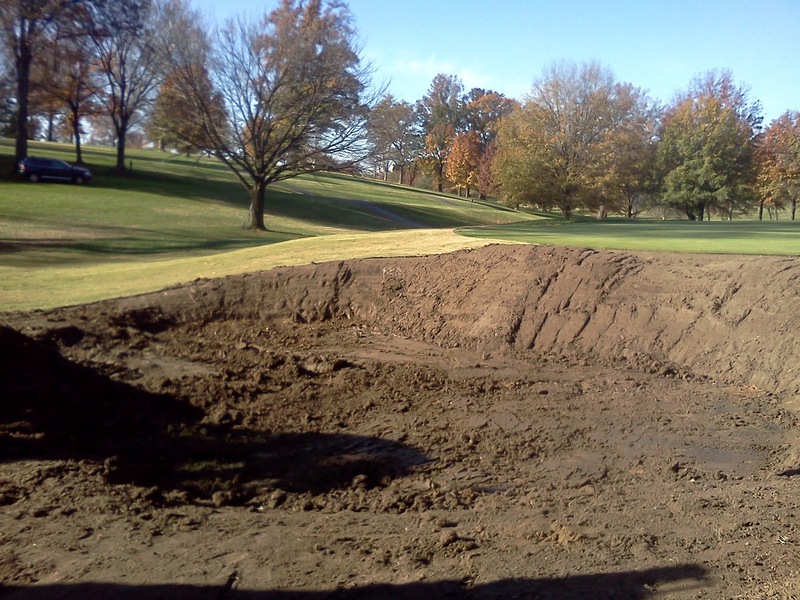 We also dug out the sand and removed the sod from around the two bunkers on #17. Kye did some finishing work on #3 and moved to #17. He has completed most of the work on the left side bunkers and removed and smoothed the area from the old front bunker. 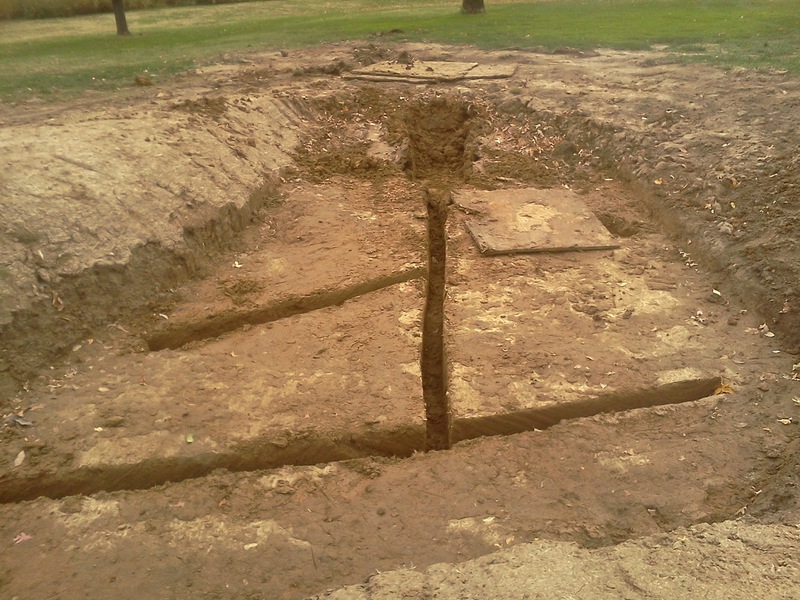 We did decide split the bunker on the left side into two bunkers because the size of a single was just too large. I'm not sure if he will be working on the right bunker on Saturday but will be completing his work by the middle to end of next week if the weather holds out. 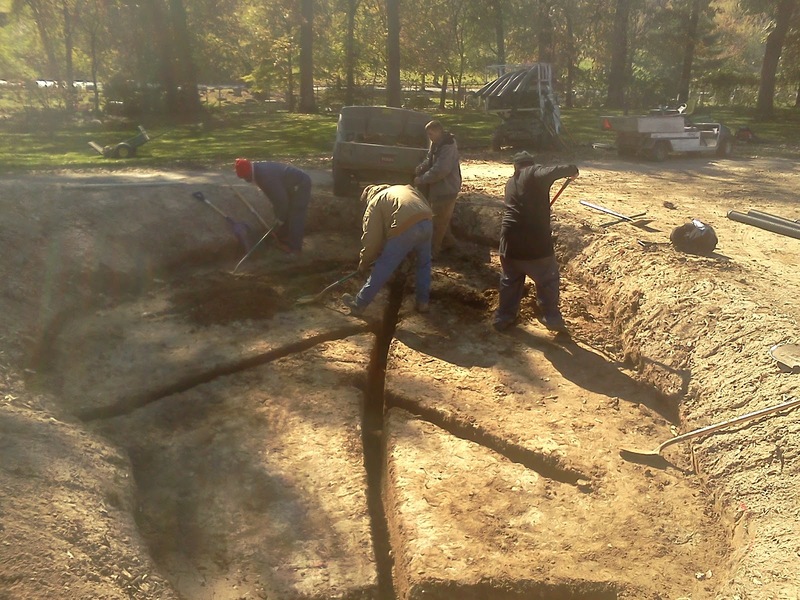 He has the right bunker on 17, the bunker on 12, the bunker on 1, the two bunkers on 6 and the practice bunker and his work will be complete. I hope we can complete the bunkers on #13 and then move back to the bunkers on #5 and #4 if they dry enough this week. 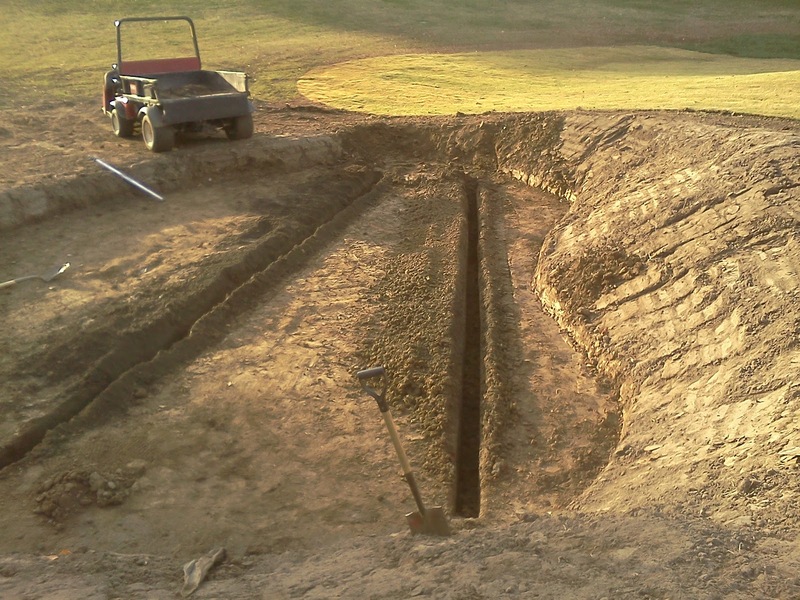 #13 left bunker drainage trenches. #13 right front bunker drainage trenches. 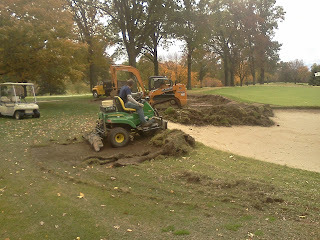 #17 sod and sand removal. 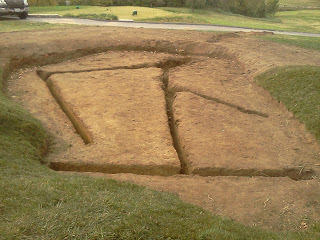 #17 left side bunker shaping.